Backyard BBQ — Dempsey Property Mgmt., Inc. This home offers 3 bedrooms on the upper level with 2 full baths. The kitchen and living/dining room are on the main level and the family room, laundry room, 1/2 bath and rec room/office are on the bottom level. The kitchen opens up to the patio on the very large, level & fenced back yard. There are hardwood floors throughout the main and upper levels. School District: Blackwell Elementary, McClesky Middle and Kell High School. 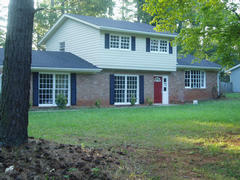 Close to KSU (will not allow fraternity or party house & parents must co-sign for college age tenants).